Peeks Around 23* is the second Buddha to find a home. This is Meditating Buddha with a Begging Bowl. I still don't know the significance behind the hand positions, etc... and need a good resource. The internet is not helping with this one. So this Buddha is maybe brass or copper and I'm guessing that the color is some sort of patina. The little table this sits on gets used a lot and it moves around depending on space and need. My bff Lisa found this table and two matching but smaller ones. And each table fit underneath the other. I don't know what happened with the other two but I got this one. It has followed me through something like 8 moves. Maybe more. And it's not the most stable thing, although I think Shawn may have done something to it to make it a little more sturdy. It's also painted gold and has some sort of damask type of pattern on it. This past summer it was in the living room. Once the plants came in Big Buddha had to move and the table had to move into our bedroom. There was stuff from the Big Buddha altar that needed a home so I decided to make a small altar in the bedroom for the winter. This new meditating Buddha is perfect for it. 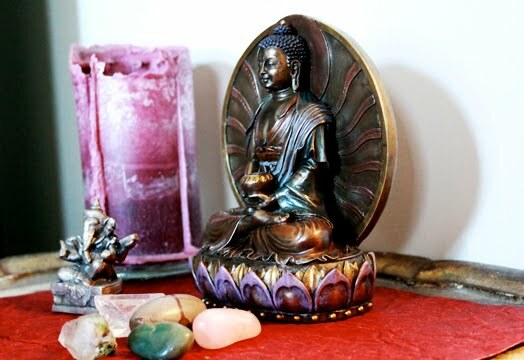 He's in the photo with his buddy Ganesha, a Buddha candle from Soaring Spirit Yoga studio, a shiva lingam stone, a couple of crystals and some other stones. It's exuding some really great energy. And ultimately there was a lesson learned from this altar that I didn't realize until this very moment. When the plants first came in for the winter I was bummed about having to move Big Buddha and losing the space. There was a hard attachment to the way things were and I was having a hard time letting go of that, even though I knew it was coming. And attachment only causes suffering. The end result of the change that I didn't want, is a beautiful altar with amazing energy that I see every. single. day. Not such a bad change after all.